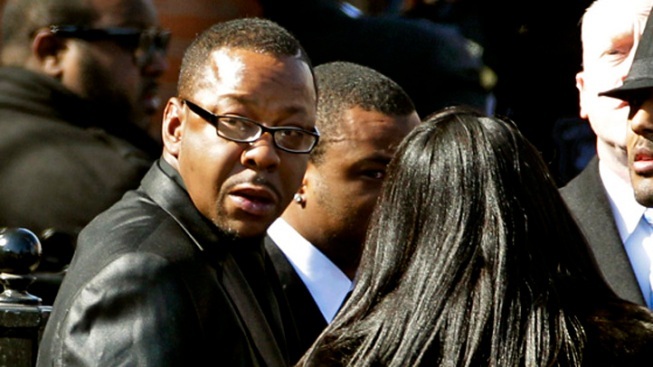 Bobby Brown left ex-wife Whitney Houston's funeral early, apparently upset over seating arrangements. Whitney Houston’s ex-husband, Bobby Brown, was among the 1,500 mourners who filed into the New Hope Baptist Church in Newark, N.J., for Saturday’s funeral for the deceased pop legend, but he didn’t stay for long. Brown arrived as the ceremony was beginning, going to the head of the church to lay his hand on the late pop singer’s casket, before heading for the back of the church. He left soon thereafter, at approximately 12:21 p.m., reported NBC New York. "I am at Whitney's funeral. I spoke with Bobby Brown trying to calm him down and not distract from the services. Today is about Whitney!" the Rev. Al Sharpton tweeted at 1:19 p.m.
Later in the afternoon, Brown issued a statement explaining his departure. "My children and I were invited to the funeral of my ex-wife Whitney Houston. We were seated by security and then subsequently asked to move on three separate occasions. I fail to understand why security treated my family this way and continue to ask us and no one else to move. Security then prevented me from attempting to see my daughter Bobbi-Kristina. In light of the events, I gave a kiss to the casket of my ex-wife and departed as I refused to create a scene. My children are completely distraught over the events. This was a day to honor Whitney. I doubt Whitney would have wanted this to occur. I will continue to pay my respects to my ex-wife the best way I know how." Brown and Houston married July 18, 1992. The couple had one child together, Bobbi Kristina Houston Brown, who was born on March 4, 1993. The marriage finally ended in divorce on April 24, 2007, with Houston being granted full custody of Bobbi Kristina. In an interview with Oprah Winfrey, Houston said that it was her daughter that encouraged her to leave Brown.